It is a nail clipper for pets that trims their nails without causing them injury or pain and saves you from hiring expensive pet grooming services. Paw Perfect is a special instrument that claims it will help you cut your pet animals’ nails all by yourself quickly and easily painlessly. Trimming pets’ nails with regular clippers can be a task prone to hurt pets but this tool guarantees there will be no pinching or snipping into their nerves and delicate skin. Paw Perfect claims it is gentle on nails as it trims and files them so smoothly that pets experience no pain and hurt but stay calm and accommodating. The Paw Perfect secret, its makers assert is the combination of rotary filing action (gentle filing features with rotating head that replaces cutting of nails) and three safety guides that prevent over-grinding. Further, it has a rubberized grip and built-in light which let you hold it steadily and ensure you don’t go wrong. In addition, Paw Perfect also cuts down the huge amount you shell out for pet grooming services as you can do it yourself with this implement right at home. The makers of the Paw Perfect mislead the viewers into believing that Paw Perfect is a miracle product – which it is not. Paw Perfect is not the only “Rotary Pet Nail Trimmer” out there in the market. There are a dozens of these rotary pet nail trimmers available at Amazon.com, these are tried and tested trimmers and come from the reputed brands like Dremel, miPets, Conair Pro and Oster. Also Paw Perfect is not all that Perfect pet nail trimmer. It comes with its own advantages, disadvantages and limitations. Owing to its weak motor, this as seen on tv pet nail trimmer is not suited for big do like Great Pyrenees and Great Danes. You have to go through all over them a couple of times to have them properly trimmed. Several rounds of trimming causes the Paw Perfect to heat up. The Paw Perfect rotary nail trimmer takes a long time and several rounds to trim the nails. The Paw Perfect’s trimming head stops spinning even with the slightest pressure. One of the few advantages of the Paw Perfect rotary nail trimmer is that it comes with a built-in light, many reviewers find this feature useful. It makes a lot of noise that scares the dogs. Some reviewers have claimed that the Paw Perfect is difficult to use from the side. It works fine when trimming from the front bot not on the sides. The Paw Perfect does not have variable speed settings which is a drawback as compared to other rotary pet nail trimmers. The Paw Perfect is made of plastic which can easily break. The most delicate part is the safety guard cap. If it gets damaged the unit is useless. It is priced at $20 and is available only at the official website TryPawPerfect.com and TryPawPerfect.ca. As compared to other similar rotary pet nail trimmers it is much cheaper. The Oster version costs $48. If the nails of your dogs are tool long then trimming them with the Paw Perfect would be excruciatingly long task. It is advisable to first cut the long nails and then trim them with Paw Perfect. 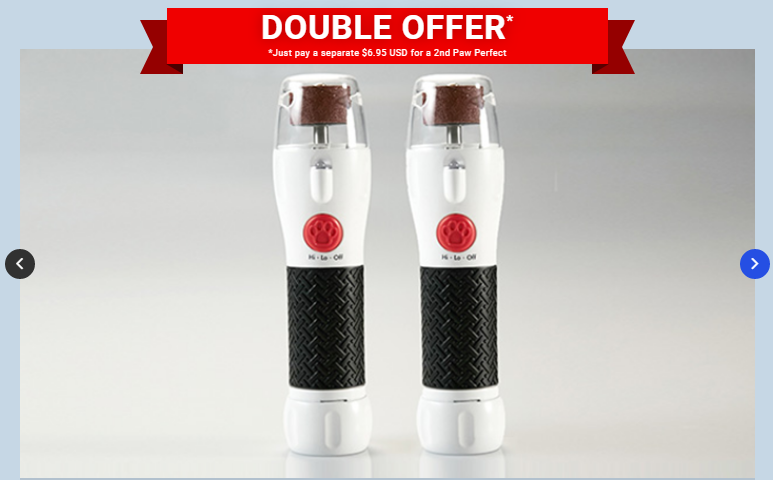 2 Comments on "Paw Perfect REVIEW | As Seen On TV Pet Nail Trimmer Review"
Don’t waste your money. It doesn’t work. The motor is to weak to actually be able to do anything. We even got 2 from different sources “just in case” we have gotten a “dud” but it didn’t make a difference. BIG waste of money. I placed an order Nov. 16 th, with pawperfect, it says delivery in two to three weeks. It is Dec. 3rd today so I phoned but was told it is on back order. Why the hell couldn’t they contact me and let me know? it was a x-mas present but I likely won’t get it on time now, if at all. I will never order from you again.